You are here: Home / Make Money Online / What is Copywriting? Though the term copywriter may be used in a variety of ways in different industries, online the title usually applies to a writer who is skilled in promotional writing. More specialized than the general ghostwriter who provides content of many kinds, a copywriter is usually hired to write words that sell something. They write item descriptions that present products in the best light. They write advertisements for print and the internet. They write copy for brochures and flyers. 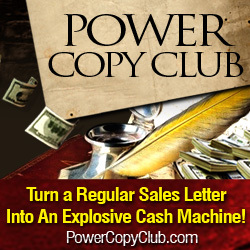 They write sales letters for the web and direct mail. Copywriters have been trained to gently (and sometimes not so gently) induce a desired response in the reader. They use words in a way that guides the potential customer to want to buy and overcomes objections by anticipating what they might be and responding to them in the copy itself. Good copy involves important principles of presenting the benefits of a product rather than listing the features and keeping the focus of your words on the reader. This is often difficult for writers without training and is what makes it particularly important that you hire the right writer for the job. Don’t make the mistake of thinking that the same person you pay to write content articles can be tapped to write a sales letter. The skills needed are different. Take care in shopping around for a copywriter for your project as they often have very different styles of writing that may appeal to different target markets. Ask for testimonials and examine examples of their work. Great copywriters have often studied under a more experienced writer and submitted to months if not years of critiques to hone their skills. Many have degrees in marketing or advertising or have come through the trenches learning their craft through personal experience. Copywriting can be a very profitable business for someone who enjoys writing compelling copy and would like to have a flexible working from home. It will take a time and hard work to establish yourself, but if you are willing to put in some effort, you can reap the rewards!